4 key sizes of G-Boards EVO boards mean that you can find the right board for any size surfer. G-Boards EVO boards offer short and wide boards, with good volume and a relatively flat deck, offer the most stable platform for your first take offs. 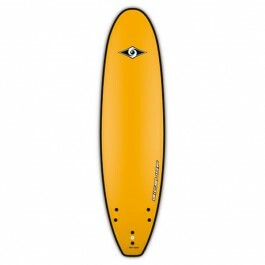 The core of the board is made from a high quality blank of closed-cell, fully watertight foam, unique to G-Boards. Flexible soft fins are safe, yet still offer solid surfing performance and durability for learning. – A full soft construction for maximum safety, comfort and no stress surfing. 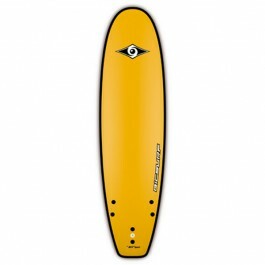 – Good volume and stability for catching waves and standing up easily right from the start. – Reliable surfing performance for ongoing progression. – As with all BIC Surf products, long term durability for years of reliable use, even when used in a surf school environment. – Short and wide boards, with good volume and a relatively flat deck, offer the most stable platform for your first take offs. – Proven rocker lines, rail shapes and board outlines surf great when you start to progress. – The core of the board is made from a high quality blank of closed-cell, fully watertight foam, unique to G-Boards. – A composite stringer gives the board good stiffness along its length, and the «Slick Skin» bottom gives the board excellent glide, cushioning bumps and offering impressive knock-resistance. – A laminated foam non-skid deck is comfortable to paddle, take-off and stand-up on. – The flexible soft fins are very safe, yet still offer suitable surfing performance and durability for learning. Get you, your family or your students correctly hooked on surfing right from the start! Make the right choice of a safe board that is easy to learn on, is fun to surf for progressing riders and is long lasting.